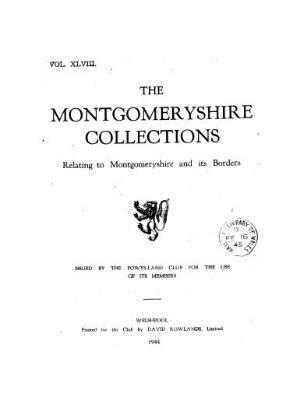 Montgomeryshire collections relating to Montgomeryshire and its borders. Collections Historical & Archaeological relating to Montgomeryshire, latterly Montgomeryshire collections, is an annual English-language journal containing scholarly articles on archaeological and historical topics, book reviews, and society notes. For digitisation, the publication has been split into three sequences: Vol 1. (1868)-Vol. 31 (1900) (entitled Collections Historical & Archaeological relating to Montgomeryshire); Vol. 32 (1902)-Vol. 47 (1942) (entitled Collections historical & archaeological relating to Montgomeryshire and its borders); and Vol. 48 (1944)-present (entitled Montgomeryshire collections : relating to Montgomeryshire and its borders). Publisher Details: The Powysland Club was founded in 1867 to promote the study of the archaeology and history of the county of Montgomeryshire. Its activities include lectures and excursions for members, publication of Montgomeryshire Collections and individual volumes, and operating museums and a library.